Newark, New Jersey Mayor Corey Booker visited The Ensemble Theatre, Saturday, February 23, 2013. He was invited by Ensemble Theatre Board Member and Shell Employee Simone Haygood and the Shell Black Networking Group (SBNG), one of Shell Oil’s several affinity groups designed to support diversity within the company. Members of the SBNG attended The Ensemble Theatre’s Black History Month drama, Knock Me A Kiss by Charles Smith. 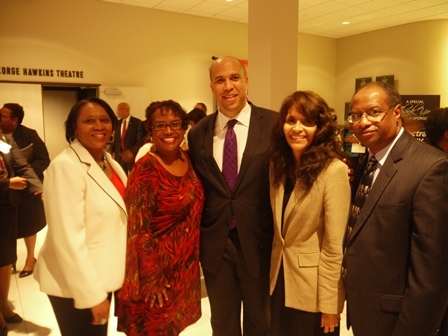 Following the play, Mayor Booker gave a presentation on leadership. He shared funny, endearing, and insightful stories about his family and other early experiences that helped shape his leadership style. He elaborated on vision, attention to detail, and collaboration, a few components of his style. 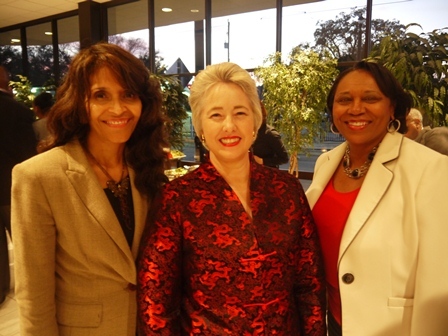 Mayor Booker graciously mingled with guests including Houston Mayor Annise Parker, Shell Employees, and Ensemble Theatre Board Members and staff.